This is a trip report from when I went from Stavanger in Norway to Kuala Lumpur in Malaysia. I used SAS and I went via Copenhagen and Bangkok on my way to KL. I used my Eurobonus frequent flyer points to upgrade to business class and that it always a treat Normally I travel with a colleague but this time I traveled alone. 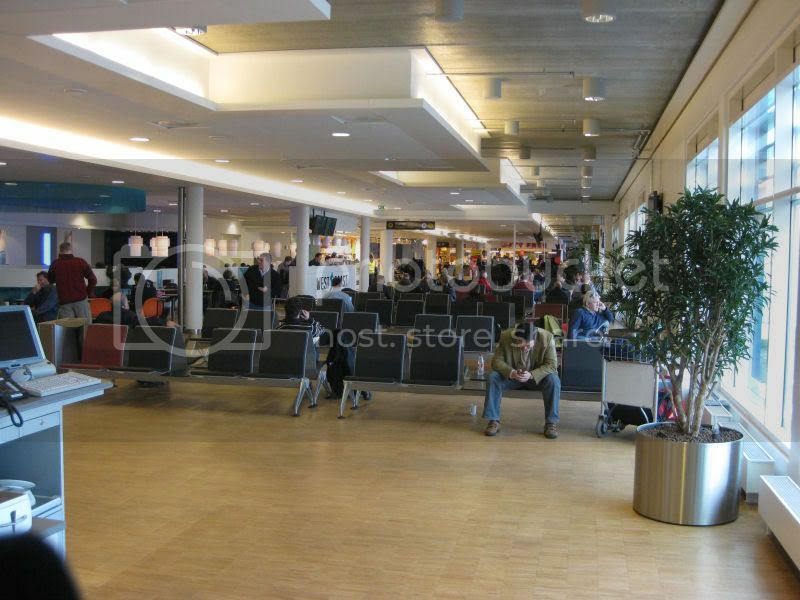 When I came to Stavanger airport on February 20th 2009 at about 4 PM there were long lines of people waiting to check in. But thanks to my SAS Eurobonus goldcard I went to the business check in counter and this line was very short so after 5 minutes I was check in. I also asked the lady behind the check in counter if you could enter a request in the system to upgrade from my current Economy Extra ticket to business class ticket using my frequent flyer points. It did not seem like she knew what she was doing as she had to ask a colleague of her for everything. Then I had to line up for security check…there is no fast track at Stavanger airport but even if the line was long it didn’t take to get through. The international section of Stavanger airport is not what I would call exciting – there is only a bar, a duty free shop and a small café. But I used the time to take some photos with my new Canon IXUS camera and as I had my laptop with me (known as Bjarne the 5th) I could also get online. 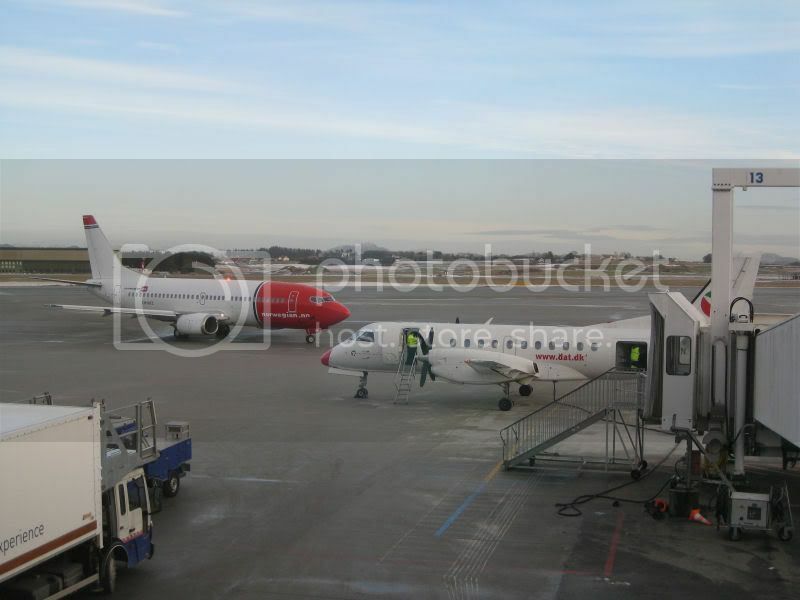 The first leg of the trip was with SK1879 to Copenhagen (CPH) and it is a flight that only takes a bit over an hour. 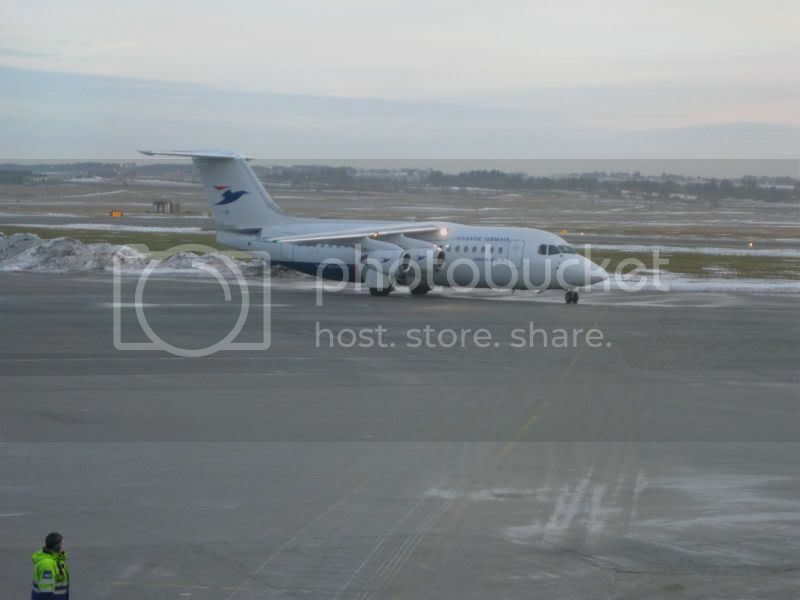 The flight is a SAS flight but it is operated by Atlantic Airways. I had an isle seat and I was happy there was a seat free between me and the guy by the window as the seats are not that wide on the BAe 146. It was also good to have some distance to the guy as he had a nasty cough. By the way, I see that Atlantic Airways have posted an explanation on the sound that you get after take off : http://www.atlantic.fo/Default.aspx?pageid=4431. 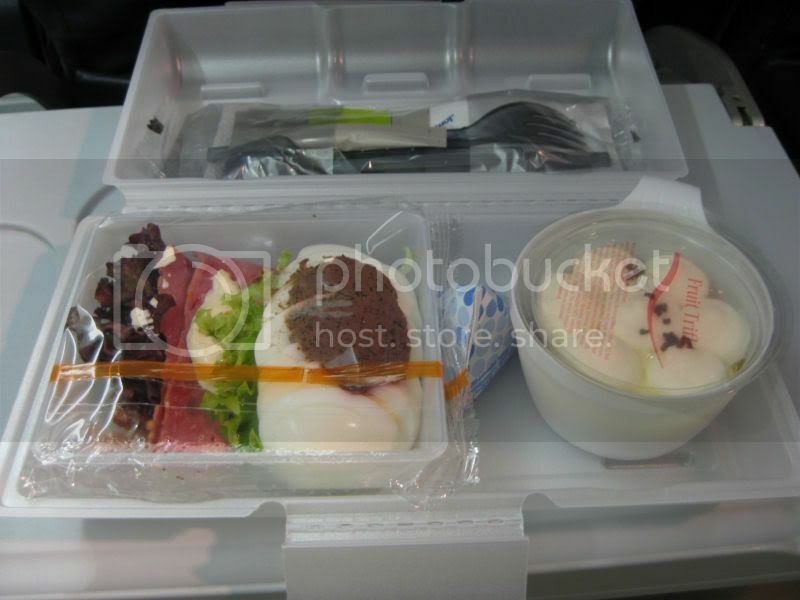 As I was in business class I got a cold meal: it was egg, some sort of ham on top of dark bread and a fruit trifle for dessert. Not too bad when you keep in mind that it is a short trip. 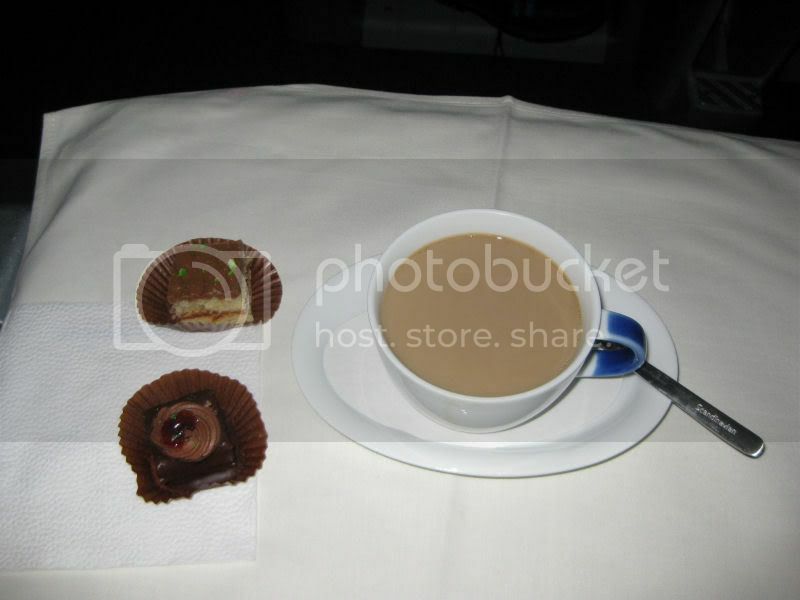 I also enjoyed a small bottle of red wine and some Baileys in my coffee on the flight. When I landed in Copenhagen I went straight for the SAS lounge. Once again I asked if it was possible to upgrade to business by using my frequent flyer points and after a bit of work on the PC the woman said “I have now posted a request for an upgrade” – based on this I’m not sure that the person that checked me in in Stavanger got it right. I had a couple of hours of waiting in Copenhagen but they had several types of cheese that I enjoyed (they even had some Manchego cheese) together with a couple of different red wines. The boarding on my next flight was not supposed to start until 10 PM but already around 9 it seemed like the gate was open so I decided to head out there to see if I could fix the upgrade. When I came to the gate there were already lots of people there and the guy in front of me wanted to upgrade his group of 4 from Economy to Economy Extra but he was told that Economy Extra was full. Due to this he went for upgrade to Business for all 4 and I thought “Oh no, there goes my chances for the upgrade”. But when I came to the counter there were still seats left in business and after 20.000 points were taken from my SAS Eurobonus account, I got a new boarding pass and got seat 4E. After a few minutes waiting we could board the plane but it took a bit of time before take off as it was snowing in Copenhagen and the plane had to go for de-icing – I think it is the first time I have experienced this in Copenhagen. But at about 11.30 PM it was finally time for take off towards Bangkok. 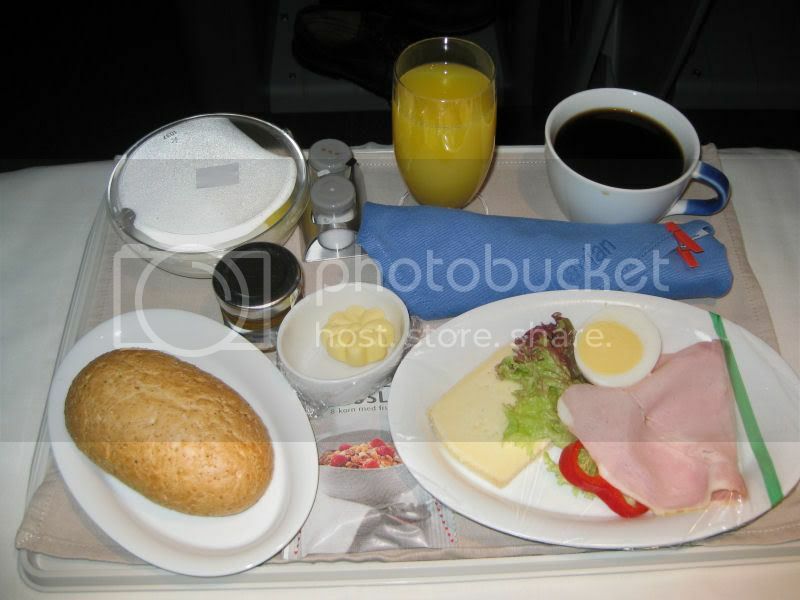 This was flight SK973 in a SAS Airbus A340. After take-off we got noise cancelling headset, slippers and the toiletry bag that contains stuff like ear plugs, eye mask, tooth brush, socks, shoe bag etc. At about 09.30 AM or 3.30 PM local time, we landed on Suvarnabhumi airport in Bangkok. Once I got out of the plane there was a sweet Thai lady with a sign with my name on it and she escorted me to the Thai counter where I got my boarding pass for the next leg. 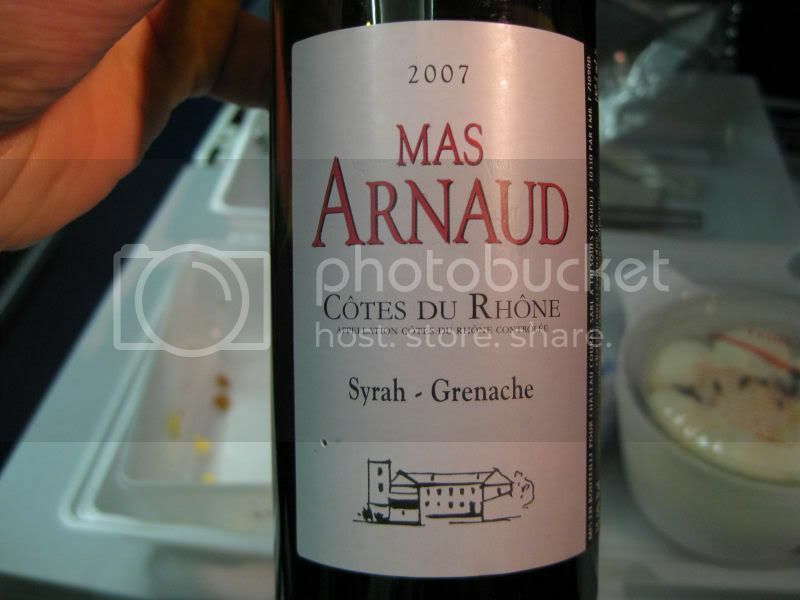 I asked if I could use my Eurobonus points for upgraded but this was not possible. 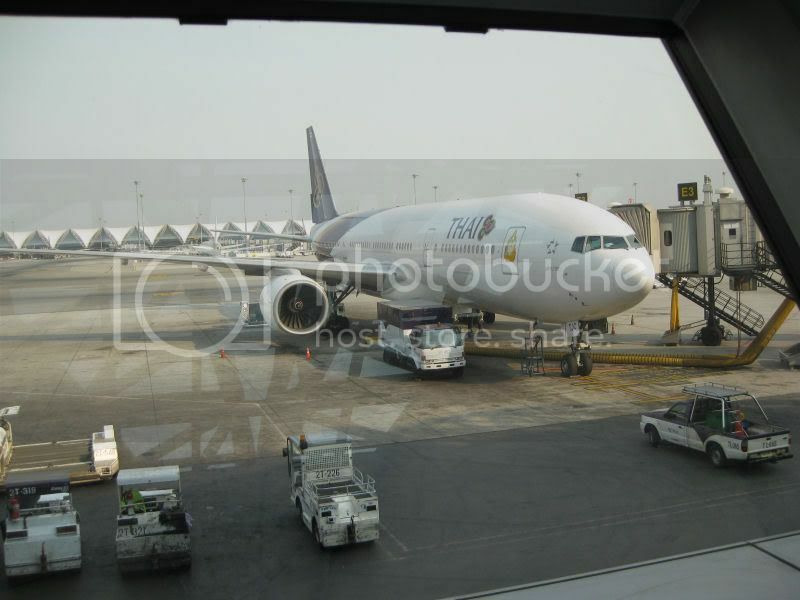 I only had an express stop in Bangkok and at 4 PM it was boarding time for TG417 and I had seat 32D in this Boeing 777-200. 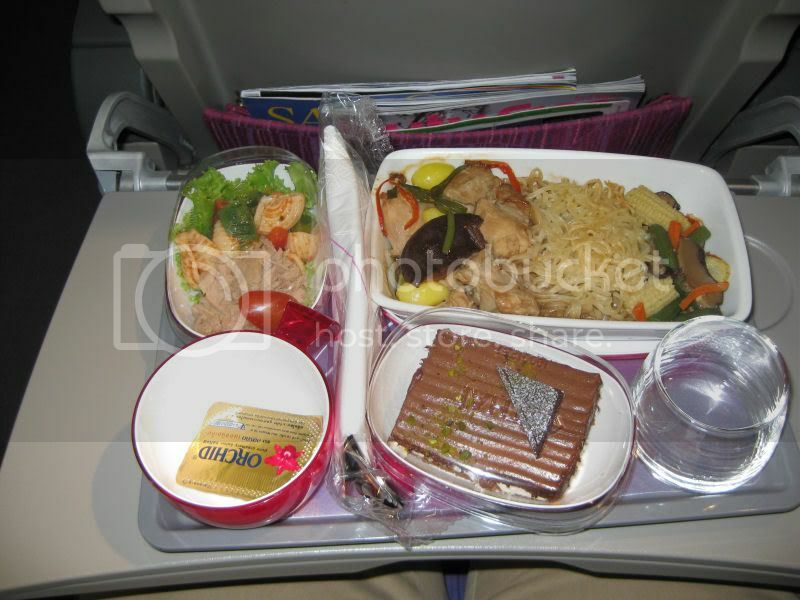 Thai Airways have a very colourful interior by the way – yellow, blue and dark pink chairs. But it is also matched by the colourful uniforms of the cabin attendants. All of a sudden it was time to food again and this time I had the option of fish or chicken. I went for the chicken with noodles and it was nice and tender and served really warm. Thai are pretty efficient when it comes to the serving (well, the plane was not full) and one example is how they serve drinks: the fill up glasses in advance with water, juice etc and put these on trays together with beer cans and then people just pick what they want when they guy walks around with the tray. The chocolate mousse was pretty good and there was also a tuna salad to start with. 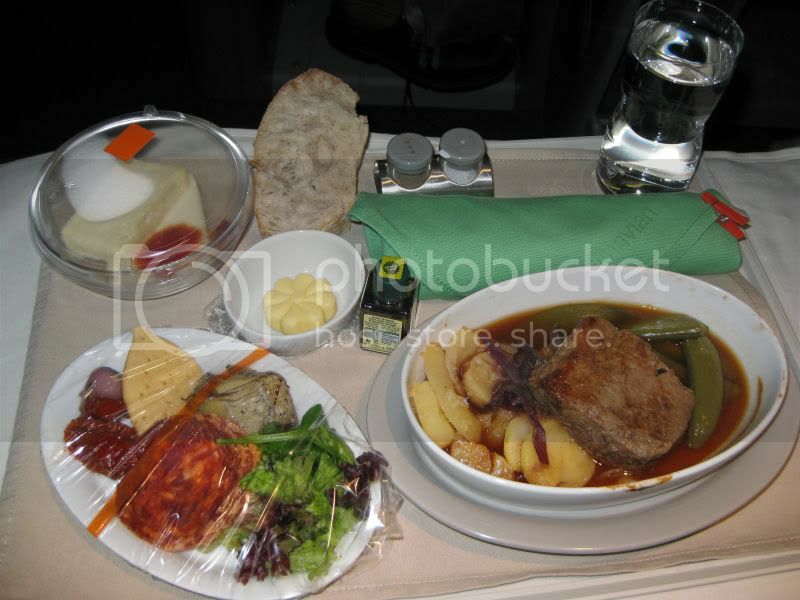 Not a bad meal for a flight that lasts less than 2 hours. At about 8 PM I landed on Sepang airport outside KL. I was a bit nervous that my luggage wouldn’t make it due to my short stop in BKK but it made it. So I got my suite case, got on the KLIA Express train and I took a taxi from KL Sentral to my hotel (Traders) where I wrote this. As you can see from my cell phone blog I can’t complain about the view at least. When I went back after a week it was in SAS Economy class and you can read about that experience here. 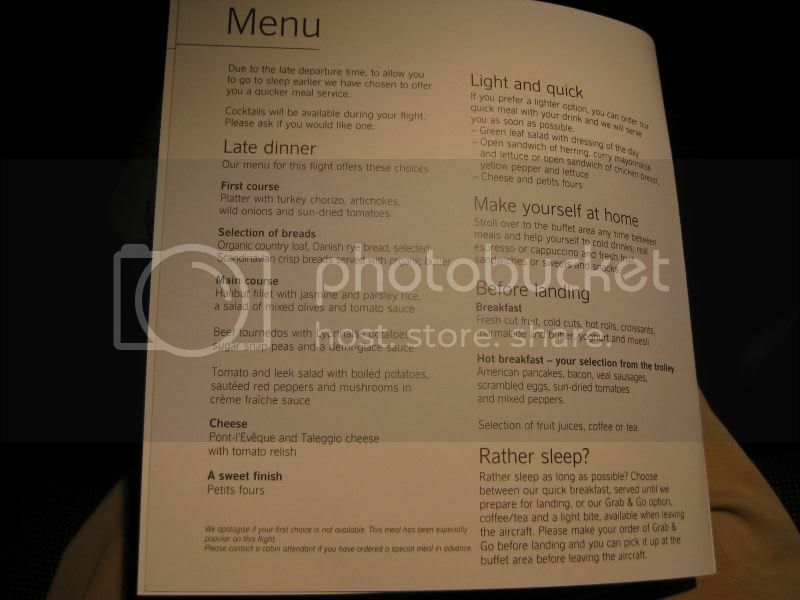 A month after this I flew on Emirates airlines in business class and it was fun comparing that to the SAS business class. 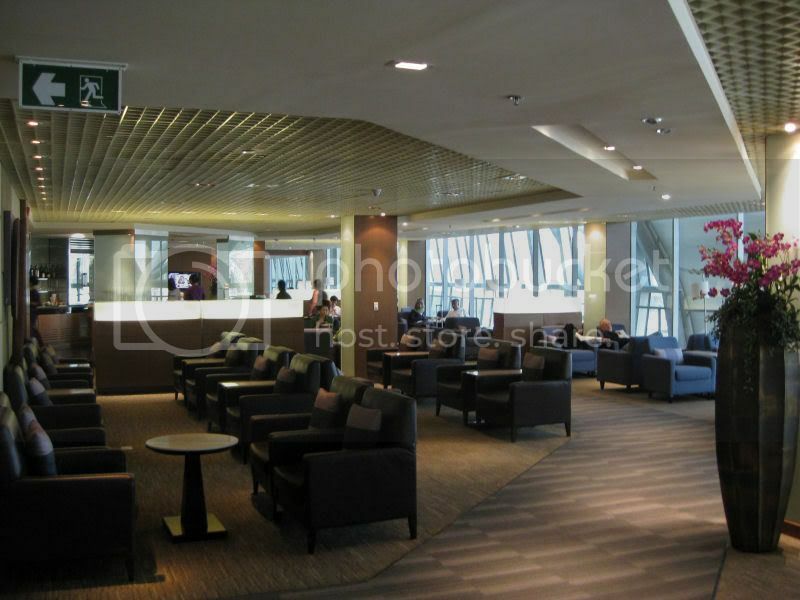 You can read about the experience with Emirates Airlines on this page. Get in touch if you have any questions. I can surely recommend thailand. For those who want to loose weight you can always try Thaiboxing. I have trained here in Lamai for a couple of weeks now and have lost approx 6 pounds all and all.